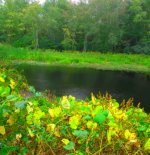 The hiking trails at the Stetson Meadows Recreation Area, an 116 acre blend of woodland, meadow and the North River and it's marshes. The Norwell portion is located at the end of Stetson Shrine Lane. 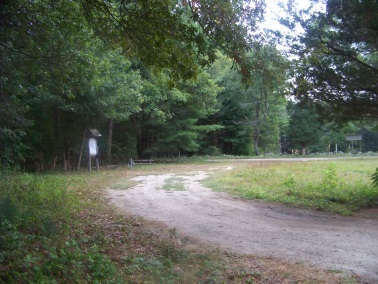 Before entering the property there is a small parking area at the end of Stetson Shrine Rd. and the trail head to the Stetson Trail. Continuing on, the road becomes dirt and becomes Meadow Farm Way. This lead to a bit of confusion on my first visit. The main parking area is at a small field called Stetson Field. It is located further down in the center of the property. This parking lot at first glance does not look to be a parking spot, but is marked as such. The dirt road down into the area, is a bit rough in sections but passable. There are also some private residences that help make it confusing where the boundaries of the conservation lie. Following the road down, you will come upon one of these residences at which the road will make a deep left turn. The parking lot is just after this. will help clear up some of the confusion. From here several hiking trails lead away. There is another meadow area called Haskins Field across the dirt road from the parking area. It is bordered by a rock wall and open gate. 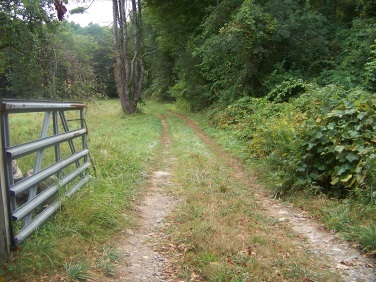 The road down through this gate is the River trail. This trail will bring you down to the river overlook and picnic area. Shortly down this trail the Salt Marsh Trail leads away to the right. 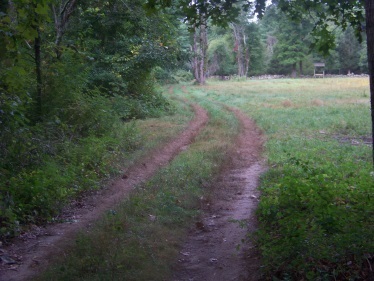 One of the better maintained trails on the property. The River Trail starts across from the parking lot through the gate and down to the picnic area. 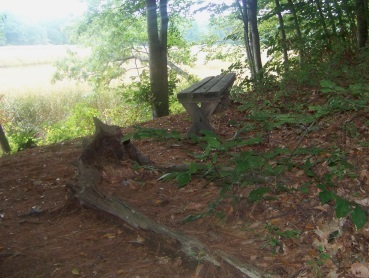 Here you will find a large open area with a picnic table, views of the North River, and trails down to its edge. gives access from the river. The hiking trail continues through the forest along the river with more views along the way. It soon comes to the edge of some private property and turns sharply to the left and climbs uphill. It comes to the edge of the entrance road at .48 miles and the Twin Pine Trail continues across the street. This is just under 1 1/4 mile. A pleasant loop through the forest with views of the North River. Crossing the meadow parking area, follow the River Trail through the gate. 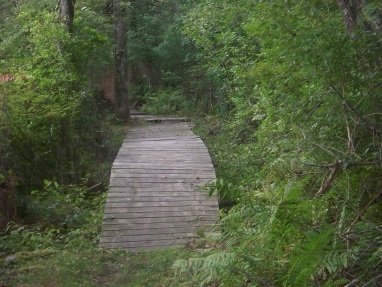 The Salt Marsh Trail leads right into the forest approx. 1/10 mile away. This trail leads gently downhill which is not noticeable till you climb it again on the exit. This part of the journey is wide and road like. Shortly down the hiking trail it leads over some boardwalks over a wet area. Soon after it reaches the loop portion. The trail map is deceiving. It shows a long trail with a small loop when in fact it is a short access trail and a fairly large loop section. Most likely newer trail, older map. 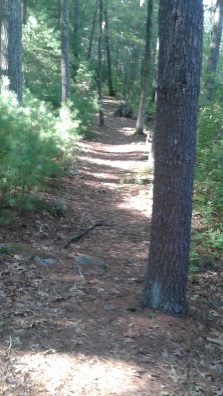 Once on the loop portion, going to the left, the trail narrows to a path. It runs through woodland and soon gently travels uphill. Views of the marshy side of the North River open up. Along the trail is an area that previously needed some heavy maintenance. Large logs line either side of the trail reminding those who hike of the enormous effort it takes to keep areas such as these clear for our enjoyment. There continues to be limited views of the river while on higher grades along with some downhill motion. The far end of the loop culminates with a small side trail leading to a bench near the area on the map referred to as Bald Hill. 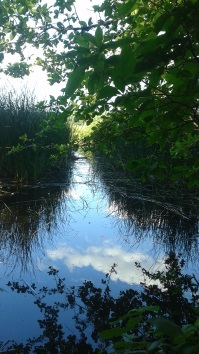 Here the river can be seen beyond the marsh grasses that line it. After the outlook, the hiking trail climbs moderately for a short way. It then makes its way through a pine lined path. You will know the loop will soon come to its finish when you pass a large glacial boulder on the left. These are sometimes also called a glacial erratic. Large boulders left behind as a glacier passed through the area thousands of years ago. Soon after, the original intersection will come in sight. Follow to the left back to the River Trail. This is mostly a short connector trail. The portion that runs through the twins is interesting. Two ancient pines standing on opposite sides of the trail. 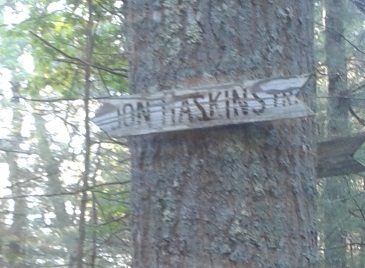 This hiking trail brings you to the Ems and Jon Haskins Trail portion that blends together. These trails as well as the Stetson Trail leave the opposite side of the main parking lot in the opposite direction of the River Trail. This is an interesting but hard to follow trail. It is another Norwell trail that left me scratching my head! Mostly due to the markings on the map. 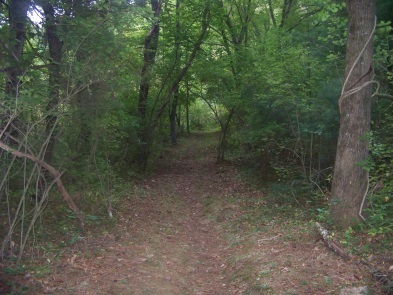 From the parking lot, the trail enters the inner forest away from the river. Shortly in, the Stetson Trail leads to the left, the EMS Trail goes right, only marked by an arrow and a conservation logo sign. At .08 the Twin Pine Trail leads straight, while the EMS and Jon Haskin Trail, now marked lead along together to the left for a short bit. At .12 the EMS takes a right. There is no sign, only a large uprooted tree stump with two narrow trails on either side. The trail continues beyond marked only by blue and pink tree ties. The Jon Haskins Trail goes straight here. 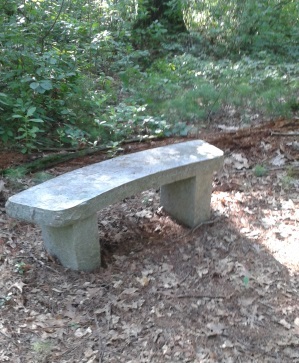 Shortly down the trail an almost magical granite bench will be found. A work of art hidden in the forest. Great place to take a rest, catch a sip of water and listen to forest creatures (mostly birds). A ways shortly down the trail after the stone bench is a trail to the left. Unmarked but is called Hemlock Grove Trail on the map. From the Jon Haskins Trail there is a faded trail sign marking this trail. Another short connector trail. The EMS Trail goes to the right here on a much more inviting route. It passes through a stone wall, becomes wider and soon intersects a cart path. Another confusing part of the journey. The map only shows what is in the recreation property. It doesn't show the other trails that play a part in the navigation of this property. 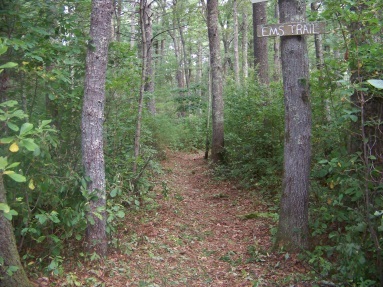 The EMS Trail leads left here. If you were to follow to the right it will bring you into one of the private properties in the area. More confusion followed. The cart path lead down to a dry river crossing at .40. This is most likely the boundary of the property but is not marked. Here was another intersection (not on the map). The cart path to the right again follows into private property. Not marked as such from this side. A large field with a pavilion at the far end. The map shows what looks to be a narrow path that forms a loop. I never found that loop path. The cart path that leads straight goes out to what appears to be a private dirt road. Perhaps what appears to be a path on the map is the course of the dry riverbed at other times of the year? 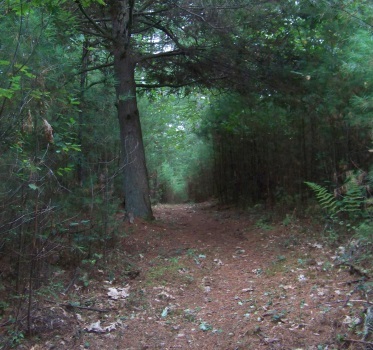 A loop can be made by following back and using the Hemlock Grove Trail . The Stetson Trail can be accessed from either the first parking area at the end of Stetson Shrine Lane or from the main parking lot at the kiosk. It is just over 1/2 mile in length. If parking your car here making a loop with the Jon Haskins Trail makes sense. From the Stetson Shrine parking area, the hiking trail starts as a short quick climb up a grassy trail. As the hill crests, the trail runs along the newly developed Stetson Meadow Cemetery. It runs several feet along the side and then re-enters the forest. It starts out fairly wide, not quite cart path but certainly wide enough to keep the foliage on the side of the trail from brushing against you. That changes soon as the pine needle path narrows and changes to grass. At .12 a very narrow trail leads to the left. Almost unnoticeable this trail leads back into the Cemetery. At .16 the Jon Haskins Trail goes to the left. Taking this left, the hiking trail leads downhill gently and is on a more narrow track. Trail ties help mark the way which is easy to follow in the summer but may become obscure in other seasons. At .19 the trail starts showing signs of overgrowth. Soon the trail runs through a wet land area and becomes clear again. After the wet area the trail becomes overgrown once again. At 1/3 mile the noise from route 3 is almost gone. At .44 it becomes wet and rooty with evidence that at some prior time someone with a bicycle attempted to ride through here! That could not have been easy! but only a few short steps and it reappears again. Soon branches of a fallen tree clutter the hiking trail and it leads out afterward to almost a clearing like appearance. Mostly this is a stand of pines crowding out undergrowth. 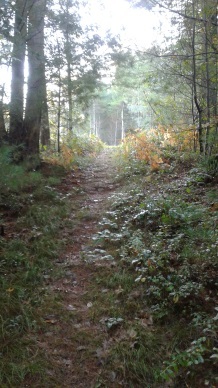 There is a faint look of a trail to the left, but it just leads to another natural clearing. The trail takes a slight turn to the right and lets out to an even larger clearing. 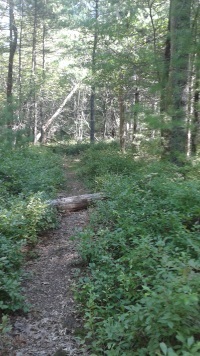 Our route runs straight through this clearing but immediately to the left you will find the Hemlock Grove Trail. There are signs here but they are pointed for travelers heading in the opposite direction. 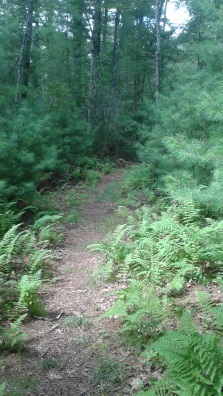 The trail continues straight on a narrow and fern lined path. At .62 it passes through a stone wall. Just after the EMS Trail leads to the left. It is not marked, but passes through the same stone wall. A large uproots tree stump blocks it entrance, but would make a great place to hold a sign! The trail continues on lined by baby pine trees. 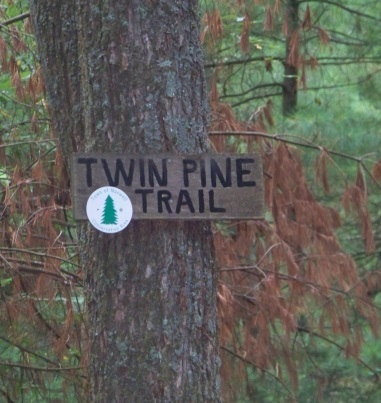 At .67 the well marked Twin Pine Trail leads to the left, the Jon Haskins/EMS Trail leads to the right. At .71 the junction of the Stetson Trail. Going left here will take you out to the Stetson Field parking lot. We continue to the right to form the loop. 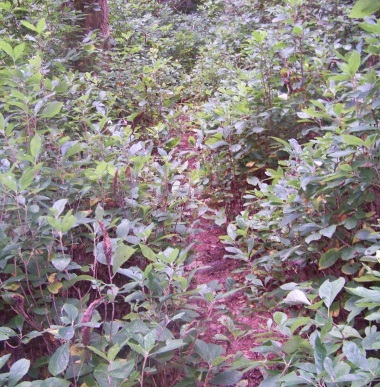 Here the Stetson Trail is covered by ground cover and leads along on a narrow path. Continuing on the trail at times widens out. It seems that in former times this part may have been a road. That appearance soon ends and the hiking trail continues narrow and soon becomes as overgrown as portions of the Jon Haskins. It clears again and becomes a bit rocky. At .77 it comes upon an area that needed clearing of trees in the past. At .88 more wet area and older trail maintenance of logs placed on the trail to help hikers through the area are slippery. Soon after the trail leads uphill and out of the wetland area. At .94 it reaches what appears to be a trail junction. This is actually where the trail takes a sharp turn to the right. The portion to the left is an extension that leads out to Meadow Farm Way. Leading to the right, the hiking trail continues wide and open. At 1.04 it starts another uphill climb. It then runs even and pleasant till 1.09 where it comes upon the original intersection with the Jon Haskins Trail. Follow the same .16 miles out and along the cemetery and down to the parking lot at the end of Stetson Shrine Lane. This loop is just over 1.25 miles. from route 3 take exit 12. Head west on route 139. Follow til the lights at route 53 (Columbia Rd.) Go right and right again on Washington St. Follow til the intersection with Broadway St and take another right. Soon Broadway becomes River St as you enter Norwell. Continue til you pass over route 3. Stetson Shrine Lane is the next right. Follow to the end. Continue on Meadow Farm Way for 2nd parking area. At the end of Stetson Shrine Lane: 2 cars at Stetson Trail head. Several places to park in that area. North River ( possibly brackish) Stream at end of EMS in season.